Shout out to JJ– Happy 28th! 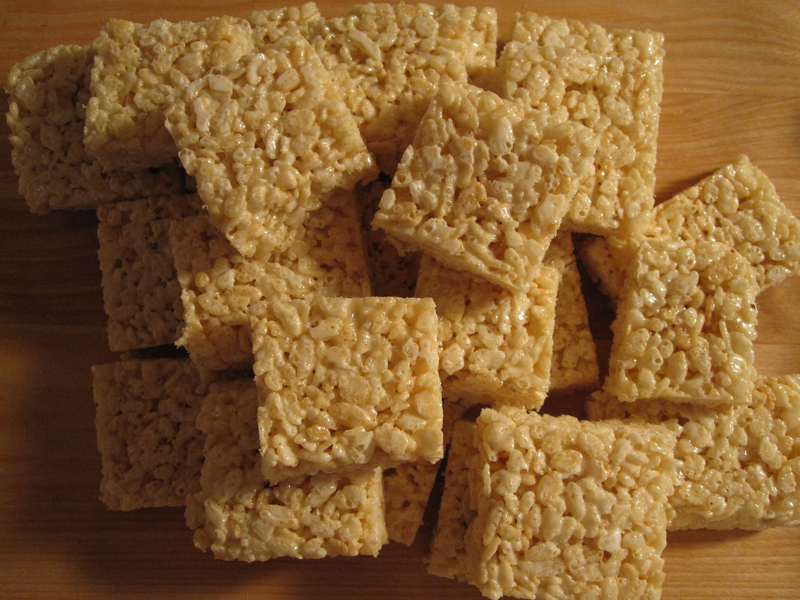 JJ loovvees rice krispie treats– so much so that he buys those imitation kinds from Starbucks on a daily basis. So for his bday, I whipped him up a batch. I hadn’t made them in years– I remember once accidentally using 3 sticks of butter instead of 3 tablespoons. It came out as butter soup w. some krispies floating in it. But as long as you can read, these are super easy and take about 10 minutes– and they taste as good as you remember. Grease 9×13 inch pan. Melt butter in pot. Add in marshmallows and stir until totally melted. Take off heat. Add rice krispies and stir. Put into greased pan. Place a sheet of wax paper on top of treats, so you can press down to flatten out. Wait until cool and cut. The Starbucks ones aren’t imitation – they are Marshmallow Dream Bars, and are quasi-delicious. That said, the birthday boy certainly enjoyed these. I’m glad that “as long as you can read,” this recipe is easy. The recipe and blog must be super-difficult for illiterates.